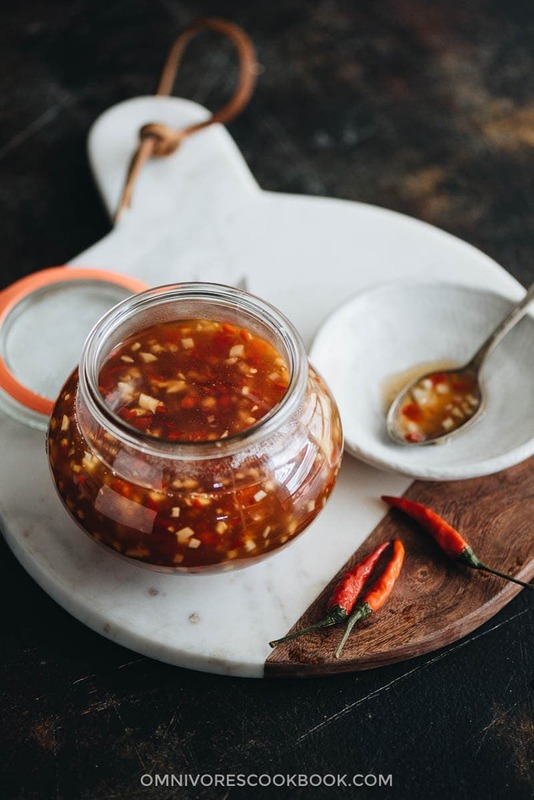 Thai sweet chili sauce probably owns a space in every Asian food lover’s pantry. Not only is it a great dipping sauce for egg rolls, fried calamari, and crispy tofu nuggets, but you can also use it as an ingredient to cook delicious stir fries as well. 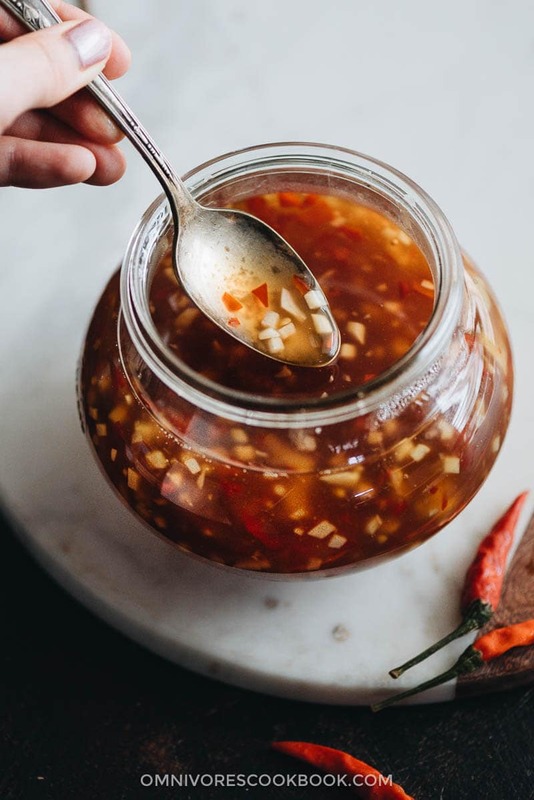 Homemade sweet chili sauce tastes even better than bottled sauce because the herbs are fresher and you can add a little boost like dry sherry to enhance the flavor. I also like the fact that I can make a tangier version that uses more vinegar. The homemade sauce is healthier too, because you can control the amount of sugar, and because it does not contain any food additives or preservatives. 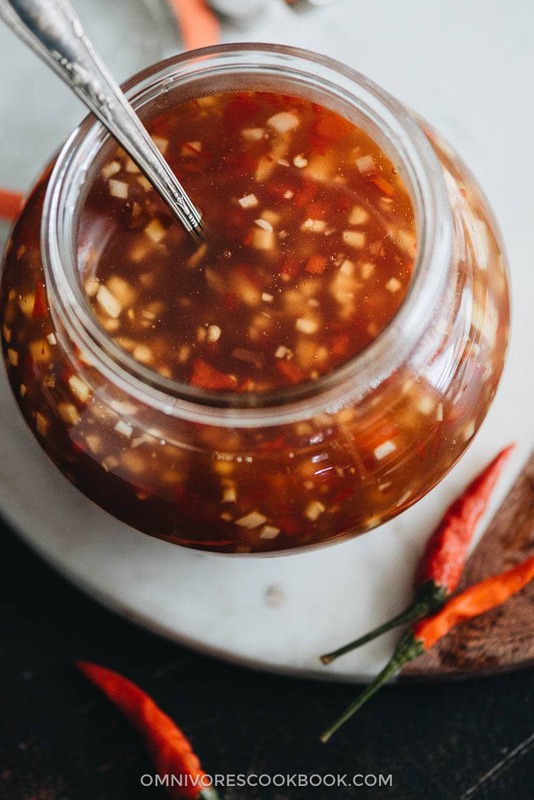 If I haven’t already convinced you to make the sauce, maybe this fact will – making the sweet chili sauce is extremely easy. You only need a few ingredients and 10 minutes! One thing to note: bottled sweet chili sauce is usually very sweet and not spicy at all. In this recipe I made the sauce quite spicy by using Thai bird’s eye chili peppers. I think the spiciness makes the sauce more interesting. If you do not want to make a spicy sauce, you should use mild crushed chili pepper flakes. I recommend Chinese or Korean chili flakes, because they are usually very mild. You can store the sauce in the fridge for about a week or in the freezer for two to three months. The sauce will congeal if you freeze it. But if you gently heat it up (on the stovetop or in the microwave) and stir it, its texture will return to normal. Do not overheat the sauce, because doing so will cause the cornstarch to lose its potency and the sauce will turn watery. Although you can store the sauce easily, storage will be the least of your problems, because you’ll be able to finish a big jar in no time! 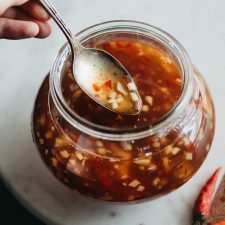 An all-purpose sauce that is not only very easy to make, but also tastes better and is way healthier than bottled sauce. Combine all the ingredients except the cornstarch in a medium-sized non-stick pan. Heat over medium-high heat and stir occasionally until bringing to a boil. Turn to medium heat. Cook and stir for 5 minutes. Turn to medium-low heat. Mix the cornstarch with 2 tablespoons water and stir until fully dissolved. Pour into the pan with the sauce. Stir constantly until the sauce thickens enough to coat the back of a spoon, 1 minute or so. Keep in mind that the sauce will further thicken once it cools. Taste the sauce and adjust the taste by adding more sugar if not sweet enough, or more vinegar if not sour enough. If the sauce turns out too thick, mix in a few spoons of water to thin it out while it’s still hot. Pour the sauce into a bowl and let sit until completely cooled. Serve it as a dipping sauce or store it in an airtight jar in the fridge for future use. It will keep in the fridge for about a week or in the freezer for up to 2 months. Is it possible to make it without any alcohol? Yes definitely. I always use a bit alcohol in my dishes to add aroma, but it’s totally OK to make this sauce without it. Simply use water to replace the wine and you’ll be all set! Can I can this sauce the traditional method of canning. Hi Dennise, I’ve never tried canning the sauce but I think it will work. If you decided to try it out, I’m looking forward to hear your feedback on it! What’s the end result suppose to taste like? Is it suppose to be sweet? or sweet and sour? IT is sweet ad sour ad HOT!!! lol tangy and delicious.